Background: Anthropometric indices are one of the ways to assess physical growth and nutritional status of children and adolescents considering the importance of nutrition in children and the role of healthy nutrition in preventing diabetes, obesity and other chronic diseases, the objective of this study is determine the relationship between nutritional knowledge and anthropometric indices in children and adolescents in Isfahan. Materials and Methods: This survey conducted using multistage cluster sampling on 1776 students aged 15–7 years old in Esfahan province in 2015. Nutritional knowledge was measured by questionnaire and height, weight, and body mass index (BMI) were measured as anthropometric index. Pearson and Spearman coefficients, regression, and T Independent were used to analyze the data; regression analysis was used to adjust the variables. Results: The mean age of students were 12.6 ± 1.9 years. About 50.3% of students were male, and most of them were studying in 5th grade of elementary school (23.8%). Most of them had normal status in terms of BMI (60.6%) and height (77.8%). There was no significant relationship between the level of BMI and height of children and adolescents, and the total score of nutritional knowledge and its domains (P > 0.05), direct and significant relationship was found between nutritional knowledge in two domains of meals and food habits and age. Conclusion: As no relationship between nutritional knowledge and anthropometric index in our study, other factors are effective in this regard, and studies are required to be conducted to examine the nutritional attitude and performance, in addition to knowledge. Obesity is a complex, multifaceted and preventable disease, which affects more than a third of the world's population., Today, obesity in children and adolescents is one of the main problems of countries. Over the past 50 years, studies have shown that the most important factors that cause early disabilities and deaths have been changed from infectious and contagious diseases to chronic diseases, so that obesity is the cause of many chronic diseases such as diabetes and hypertension, and so on. Since obesity causes obesity in adolescence, obesity in childhood and adolescence is very important. Since most nutritional habits are formed and established during adolescence, it is important to pay attention to the nutritional status of individuals, especially in childhood and adolescence. In this regard, several anthropometric indices have been used for assessing obesity in individuals. These indices include neck size, waist circumference, BMI, waist to hip ratio, waist-to-thigh ratio, and subcutaneous fat. The findings indicate an increase in the prevalence of obesity and overweight in Iranian children in recent years so that the prevalence of overweight in the age group of 11–6 years has risen from 12% in 1998 to 19% in 2002. Several genetic, behavioral, and environmental factors have also been recognized effective in causing obesity and high body mass index (BMI)., Proper nutrition is one of the most important determinants of the incidence of disease and health during a lifespan. Nutrition education should be the first step in educating the obese people. UNESCO has determined one of its goals in the planning of primary education improving the growth and development of potential talents and establishing healthy behaviors in children and adolescents. Proper and diverse nutrition is one of the most important components of health and one of the main areas of school health. The results of a study conducted by Kelishadi et al. showed that nutrition in Iran is usually limited to the consumption of certain specific foods and there is no diversity in food consumption. Similar to many developing countries, inappropriate nutrition is also increasing in Iran so that a study conducted in 6–18 cities in Iran showed that students aged 6–18 years have poor nutritional habits. Studies in Iran have been carried out in the field of nutritional knowledge, but its relationship with anthropometric indices has not been investigated. Finally, given the importance of nutrition in children and adolescents and the role of healthy nutrition in preventing the diabetes, obesity, and other chronic diseases, and the lack of a comprehensive epidemiological study in Isfahan province, we decided to evaluate the relationship between nutritional knowledge and anthropometric indices in children and adolescents in Isfahan city. This research was a cross-sectional, conducted using multistage cluster sampling on 1776 students aged 15–7 years, studying in one of the primary or secondary schools (in public and nonprofit schools) of Isfahan province in 2015. The 95% confidence interval, the reference population of 800,000, the obesity rate in boys was 33.7%, and the 2% confidence interval was 2120 students. According to attritional rate, 1776 students completed the questionnaire. In the first stage, the number of clusters was determined by the quota of students in each city, and in the second stage, clusters were determined by the quota of students in rural and urban areas, and in the third stage, the gender quota of the male and female students was determined. The classes were randomly selected in each school, and the samples were systematically selected, and questionnaires were completed. Questionnaires that did not respond to 20% or more of the questions were excluded from the study. A questionnaire was used to assess the knowledge and performance of elementary school students in the area of nutritional education in the academic year of 2014–2015. Its validity and reliability had already been confirmed the validity of the questionnaire was obtain by consulting of expert; reliability analysis yielded Cronbach's alpha value of 0.70 for knowledge. The questionnaire contained questions about the demographic variables of students such as age, gender, educational level, father's education, mother's education, parent's job, weight, height, and BMI. In the section related to foods group, there were some questions about food groups, food meals, food habits, minerals, and vitamins. In the section related to foods group, there were some questions about food groups which contains 7 questions, food meals which contains 3 questions, food habits which contains 3 questions, minerals, and vitamins which contains 5 questions. A total of 50 questioners were used to distribute and complete the questionnaires. They were trained at the workshop for 8 h using the same method. The correct answer is the number one, and the wrong answer is zero, and the score was then given from 18. In addition, in order to standardize the questionnaire and to complete the questionnaire with minimum error, an instruction containing 21 sections was developed and provided to the interviewers and observers. The questioning was performed at school, and the questionnaires were completed using self-administration method. Before completing the questionnaire, how to complete the questionnaire was taught to students, and anthropometric indices were measured by health-care providers. These indices included the weight and nonshoe height of students. They were measured using Saca medical scale (made in Germany) and the strip meter (made in Iran), respectively. Finally, the BMI was calculated by dividing weight (kg) by height (square meter) of the students. To measure the height, the individuals paired their feet vertically beside the wall and stood on a flat surface with a right angle to the stripe meter installed on the wall. Heels, hips, back, and skull (if possible) needed to stick to the wall. The test should look straight and forward, and the hands should be comfortable around the body. The subject was trained to inhale and lift his body upward. The subject slides down the wooden ruler onstrip meter so tip of the subject head and records to the nearest 0.1 cm. We also used a weighted scalable scale to measure the weight. The subject should be weighted without shoes and at the minimum clothing. To achieve a better result, repeated measurements were performed at the same time of the day, and nutritional status and dehydration were similar to those after evacuating the body (preferably in the morning or 12 h after eating food), and the measurement was finally recorded to the nearest 0.1 kg. One of these measurements to determine the optimal weight is the use of the BMI and the unit of its measurement is kilograms per square meter, calculated by dividing the weight in kg by height in square meter. BMI below 5% is regarded as low weight, BMI between 5% and 55% is considered normal, BMI between 85% and 95% is considered overweight, and BMI over 95% is considered obese. After collecting the questionnaires and qualitative control of them, the data were entered into SPSS version 16 software. (Chicago, IL, USA) Pearson correlation coefficient was used to determine relationship between BMI and height of children and adolescents with total score of nutritional knowledge and its domains, to compare the knowledge score, in two sexual groups T independent was used, Spearman coefficient was used to determine the relationship between parent's education and knowledge score and regression analysis was used to adjust the variables. The statistical significance level was considered as <0.05. 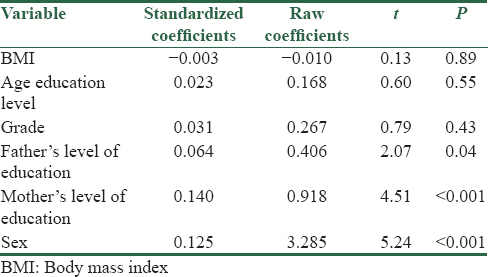 Multiple linear regression analysis showed that among the demographic variables in the table, gender, mother's education level, and father's level of education were significant predictors for the total score of nutritional knowledge, respectively. In the presence of these three variables, BMI, age, and educational basis were not significant predictors for the total score of nutritional knowledge. A total of 1776 children and adolescents aged 7–15 years were included in the study with a mean age of 12.6 ± 1.9 years, and the highest frequency (23.8%) was in the 5th grade of primary school, of which 893 (50.3%) were male and 883 (49.7%) were female. The mean weight of the individuals was 42.5 with a standard deviation of 12.88 kg, mean height of them was 149.1 with a standard deviation of 14.7 cm, and mean BMI of them was 18.9 with a standard deviation of 4.2. 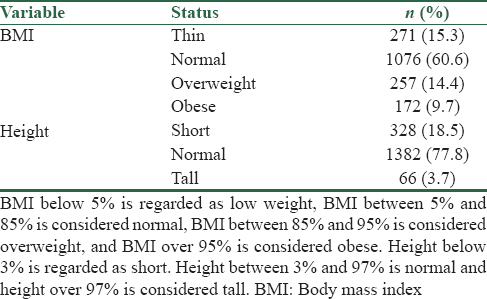 Most of the individuals are in a natural state in terms of BMI (60.6%) and height (77.8%) [Table 1]. The findings showed that the mean total score of nutritional knowledge in children and adolescents was 43.8%. The highest nutritional knowledge of students was related to meals with a mean of 71.5, and the lowest was related to food habits with mean of 32.01 [Table 2]. Spearman's correlation coefficient showed that there was no significant relationship between BMI and height of children and adolescents and total score of nutritional knowledge and its domains (P > 0.05) [Table 3]. Independent t-test showed that the mean score of total nutritional knowledge and all its domains in females was significantly more than that in males (P< 0.001). In other words, there was a significant relationship between students' gender and their nutritional knowledge [Figure 1]. Pearson correlation coefficient showed that nutritional knowledge score in two domain of meals and food habits had a direct correlation with age (P< 0.001), but the total score of nutritional knowledge and its other domains showed no significant correlation with age (P > 0.05). Spearman correlation coefficient showed that the score of nutritional knowledge in three domains of nutritional habits, minerals, and vitamins had direct correlation with educational level (P< 0.001), but the total score of nutritional knowledge and the domain of food groups showed no significant correlation with educational level (P > 0.05) [Table 4]. Spearman correlation coefficient showed that the total score of nutritional knowledge and domains of food groups, and minerals and vitamins had a direct correlation with the education level of fathers and mothers (P< 0.05), but the nutritional knowledge score in the area of means showed no significant correlation with education level of fathers and mothers (P > 0.05) [Table 5]. Multiple linear regression analysis showed that among the demographic variables in the table, gender, mother's education level, and father's level of education were significant predictors for the total score of nutritional knowledge, respectively. In the presence of these three variables, BMI, age, and educational basis were not significant predictors for the total score of nutritional knowledge [Table 6]. In this study, the relationship between nutritional knowledge and anthropometric indices was assessed. No significant relationship was found between BMI and height of children and adolescents and total score of nutritional knowledge and its domains. This finding was in line with the findings of the studies conducted by Safarjani et al., who assessed the nutritional knowledge and anthropometric status as well as findings of the study conducted by Nasiri Zarrin Ghabaee et al. on female high school students in Bojnurd in 2012. In addition, no relationship was found between BMI and nutritional knowledge. In the present study, the mean score of total nutritional knowledge and all its domains in females was significantly more than that of males, which is in contrast with results of the study conducted by Lynch in the United States. However, in a study conducted to examine the nutritional knowledge of Norwegian-Swedish Americans, knowledge of females was more than that of males. Results of our study also showed that nutritional knowledge score in two domains of meals and food habits had a direct relationship with educational level and age. In other words, there is a direct relationship between meals (breakfast, lunch, and dinner) and food habits and behaviors, while the total score of nutritional knowledge and its other domains did not show a significant relationship with the age and educational level. In explaining this result, it can be said that people pay more attention to their health and their meals and use foods with higher nutritional value as their age increases and gain more knowledge and experience. The findings of this section of the study were consistent with those of the study conducted by Mortazavi and Roudbari, who male high school students in Zahedan. Moreover, a direct correlation was found between the total score of nutritional knowledge, food groups, nutritional habits, minerals and vitamins, and education level of fathers and mothers in this study, and results of other studies show the positive effect of level of education of parents and knowledge of families on nutrition and BMI. For example, the study conducted by Jahani et al. to examine the effect of nutrition on BMI of secondary school students showed the effect of the education level of mothers in this regard  so that the prevalence of overweight and obesity in the children of parents with higher education was significant is high. However, in the study conducted by Ramazankhani et al., no significant relationship was found between the two variables of nutritional knowledge and parental education. According to a study, parents' level of education has a positive impact on nutrition and BMI, which suggests that parents can play an effective role, since their nutritional knowledge and behavior would vary due to differences in the level of education, population control, and economic and cultural status which affect the indices such as BMI, height, or weight. Therefore, increasing the knowledge of families, especially through media, holding workshops and training classes, participating in behavioral adjustment programs, promoting nutritional culture, implementing interventional programs to prevent maladaptive behaviors have a significant role in improving the nutritional status and consequently the BMI of children and adolescents. In general, it can be stated that importance of knowledge and proper nutritional performance of community members, especially during adolescence, determining the physical health, is evident for all people. Children and adolescents spend nearly half their time at school, and given the presence of millions of students in schools, schools are considered as an appropriate place to teach nutrition for the students, which its impacts are seen not only in their knowledge but also in their nutritional patterns. Thus, the inclusion of nutritional training programs in schools as well as providing a proper pattern of food consumption to them and encouraging them to participate in behavioral adjustment programs and so on can be a good way to improve their health. Therefore, it is the responsibility of the health authorities to promote the nutritional knowledge of the families, especially adolescents on the healthy nutrition by providing appropriate educational programs. To assess knowledge, a more complete questionnaire was needed. The authors of the article appreciate Research Deputy and Health Deputy of Isfahan University of Medical Sciences, Isfahan Province Department of Education, school administrators and teachers, and students who participated in conducting this research. This thesis is sponsored by Isfahan University of Medical Sciences with code 396155. This knowledge study was studied and other than knowing knowledge, it's better to examine the attitude and function of individuals. American Medical Association. Adopts New Policies on Second Day of Voting at Annual Meeting; 2013. Available from: http://www.ama-assn.org/ama/pub/news/news/2013/2013-06-18-new-ama-policies-annual-meeting.page. [Last accessed on 2014 Apr 07]. Ng M, Fleming T, Robinson M, Thomson B, Graetz N, Margono C, et al. Global, regional, and national prevalence of overweight and obesity in children and adults during 1980-2013: A systematic analysis for the Global Burden of Disease Study 2013. Lancet 2014;384:766-81. Stevens GA, Singh GM, Lu Y, Danaei G, Lin JK, Finucane MM, et al. National, regional, and global trends in adult overweight and obesity prevalences. Popul Health Metr 2012;10:22. Schiel R, Kaps A, Bieber G, Kramer G, Seebach H, Hoffmeyer A, et al. Identification of determinants for weight reduction in overweight and obese children and adolescents. J Telemed Telecare 2010;16:368-73. Pulgarón ER. Childhood obesity: A review of increased risk for physical and psychological comorbidities. Clin Ther 2013;35:A18-32. Berenson G, Srinivasan S, Chen W, Li S, Patel D, Bogalusa Heart Study Group, et al. Racial (black-white) contrasts of risk for hypertensive disease in youth have implications for preventive care: The Bogalusa Heart Study. Ethn Dis 2006;16:S4-2-9. Serdula MK, Ivery D, Coates RJ, Freedman DS, Williamson DF, Byers T, et al. Do obese children become obese adults? A review of the literature. Prev Med 1993;22:167-77. Harvey-Berino J, Hood V, Rourke J, Terrance T, Dorwaldt A, Secker-Walker R, et al. Food preferences predict eating behavior of very young Mohawk children. J Am Diet Assoc 1997;97:750-3. Ben-Noun LL, Laor A. Relationship between changes in neck circumference and cardiovascular risk factors. Exp Clin Cardiol 2006;11:14-20. Esmaillzadeh A, Mirmiran P, Azadbakht L, Azizi F. Changes in overweight prevalence among Tehrani children and adolescents: Comparison of three different definitions. Razi J Med Sci 2006;13:19-30. Shahgholian N, Aieen F, Daris F. The ninetieth percentile (BMI) and some risk factors of obesity in children 7-12 year's old province of Chahar Mahal Bakhtiari. Shahrekord 2002;1:42-8. Ramezankhani A, Dolati MR, Khodakarim S. The study on relationship between education, employment and economic status of parents with overweight and obesity in students of primary schools in different parts of Tehran, 2012. Iran J Nutr Sci Food Technol 2013;7:197-205. Jolly K, Daley A, Adab P, Lewis A, Denley J, Beach J, et al. Arandomised controlled trial to compare a range of commercial or primary care led weight reduction programmes with a minimal intervention control for weight loss in obesity: The lighten up trial. BMC Public Health 2010;10:439. Mesas AE, Guallar-Castillón P, León-Muñoz LM, Graciani A, López-García E, Gutiérrez-Fisac JL, et al. Obesity-related eating behaviors are associated with low physical activity and poor diet quality in Spain. J Nutr 2012;142:1321-8. Jolaee S, Mehrdad N, Bahrani N, Moradi Kalboland M. A comparative investigation on health behaviors of students in primary schools with and without health educator. J Hayat 2004;10:55-62. Magarey AM, Daniels LA, Boulton TJ, Cockington RA. Predicting obesity in early adulthood from childhood and parental obesity. Int J Obes Relat Metab Disord 2003;27:505-13. Kelishadi R, Pour MH, Sarraf-Zadegan N, Sadry GH, Ansari R, Alikhassy H, et al. Obesity and associated modifiable environmental factors in Iranian adolescents: Isfahan healthy heart program – Heart health promotion from childhood. Pediatr Int 2003;45:435-42. Zamani Alavijeh F, Soghrat Faghihzadeh, Fatemeh Sadeghi. Application of the health belief model for unhealthy eating prevention among primary school children in Arak/Iran (2004-2005). JOURNAL OF KERMANSHAH UNIVERSITY OF MEDICAL SCIENCES (BEHBOOD). 2008;11:352-67. [Persian]. Azad-Bakht L, Mirmiran P, Momenan AA, Azizi F. Knowledge, attitude and practice of guidance school and high school students in district-13 of Tehran about healthy diet. Iran J Endocrinol Metab 2004;5:409-16. Naeeni MM, Jafari S, Fouladgar M, Heidari K, Farajzadegan Z, Fakhri M, et al. Nutritional knowledge, practice, and dietary habits among school children and adolescents. Int J Prev Med 2014;5:S171-8. Barlow SE; Expert Committee. Expert committee recommendations regarding the prevention, assessment, and treatment of child and adolescent overweight and obesity: Summary report. Pediatrics 2007;120 Suppl 4:S164-92. Safarjani F, Golestan B, Derakhshani K, Rustaee R, Rasooli B. Are adolescent girls enjoying anatomical status and nutritional knowledge? Pejuhandeh J 2005;10:9-15. Nasiry Zarrin Ghabaee D, Khalatbary A, Rajabzade R, Abbaspour H, Kameli A. Relationship between food habits with body mass index (BMI) and fat distribution (WHR) in high school girls in Bojnurd. J North Khorasan Univ Med Sci 2015;6:925-34. Lynch W, Eppers K, Sherrodd J. Eating attitudes of native American and white female adolescents: A comparison of BMI- and age-matched groups. Ethn Health 2004;9:253-66. Girois SB, Kumanyika SK, Morabia A, Mauger E. A comparison of knowledge and attitudes about diet and health among 35- to 75-year-old adults in the United States and Geneva, Switzerland. Am J Public Health 2001;91:418-24. Mortazavi Z, Roudbari M. Breakfast consumption and body mass index in primary, secondary and high school boys in Zahedan 2005-2006. Iranian Journal of Endocrinology and Metabolism. 2010;12:345-51. Weker H. Simple obesity in children. A study on the role of nutritional factors. Med Wieku Rozwoj 2006;10:3-191. Ghanbari S, Ayatollahi SM. Comparing the role of standard references on the prevalence of Iranian children and adolescents' overweight and obesity: A systematic review and meta-analysis. Journal of research in medical sciences: The official journal of Isfahan University of Medical Sciences. 2016;21:121. Ramazan Khani D, Hosseinpour KH. The Relationship between the level of education, employment and the economic status of parents and obesity and overweight in students of schools in different districts of Tehran in 2012. J Nutr Sci Food Ind Iran 2013;7:197-205. Contento IR, Randell JS, Basch CE. Review and analysis of evaluation measures used in nutrition education intervention research. J Nutr Educ Behav 2002;34:2-5.